Forced Induction Interchillers is now offering Thermal reduction plates to reduce heat transfer caused by the supercharger sitting directly on the cylinder heads and spacing the charger up off the valley of the engine. 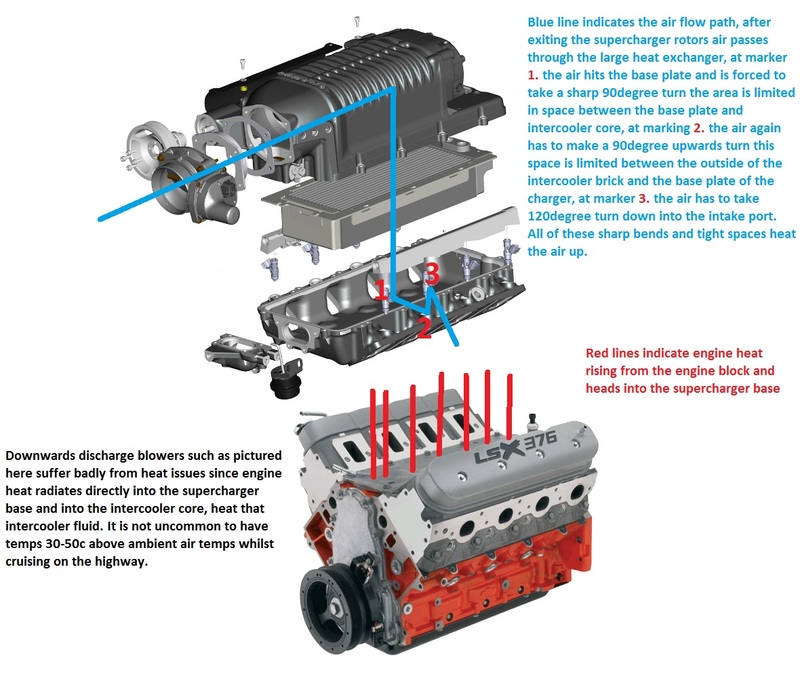 The supercharger being in direct contact with the cylinder heads and sitting directly over the valley of the engine reduces thermal efficiency and heat is always the enemy in positive displacement superchargers. With the Thermal reduction plates the blower will operate significantly cooler and make it perform as if were in cooler weather consistently. The air entering the combustion chamber will average lower temps and be denser, allowing a HP gain and in tuning more ignition timing thus again more HP. 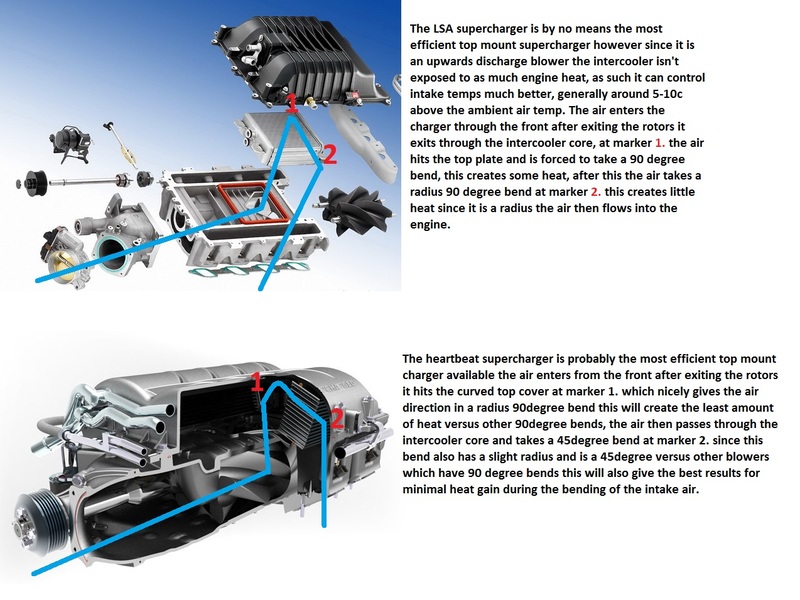 Many people often give a cult following to certain brands of superchargers, however not many people have taken the time to look into how the superchargers intercooler system works and what effect one blower will have over another type. 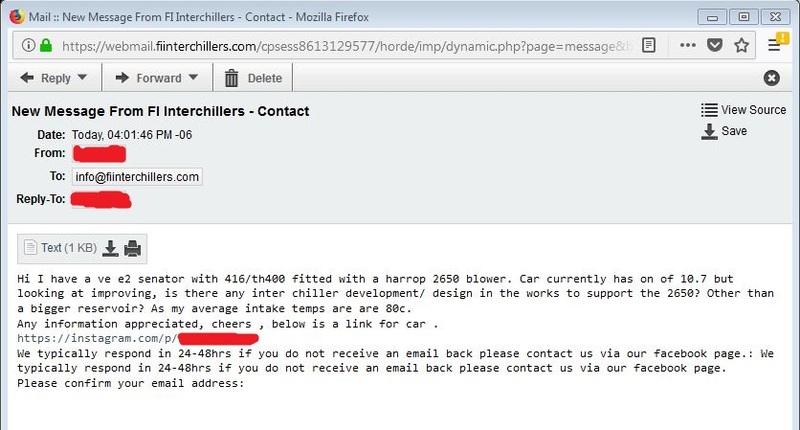 With downwards discharge style blowers we have seen very high intake temps even on low boost and even whilst cruising on the highway not under boost, so much so one person was getting temps as high as 60c (140f) on a 30c (86f) day whilst on the highway not even in boost. So amazed at how high his temp was he called another shop and asked if they had the same. The answer was on a 30c (86f) day they also see intake temps as high as 60-80c (140-176f) simply just cruising around not under boost. These very high intake air temps will cause poor fuel consumption, ignition timing and HP loss/reduction, fuel vaporization and when you do enter boost EXTREMELY high intake air temps which can create a higher risk of engine knock which can result in engine failure if not tuned to remove very large amounts of ignition timing. We have drawn up a couple of images to show you how this effect is taking place. This is your typical downwards discharger blower such as the Whipple, Walkinshaw, SLP, older style Magnuson and Harrop blowers. What engines and Superchargers do the plates suit? The plates will have a very dramatic effect on downwards discharge style blowers as they suffer the most from heat soak, they will also have a temperature reduction on upwards discharge blowers such as the LSA and Heartbeat. We have noticed with the LSA blower combined with our interchiller that that entire blower absorbs the cold temperature not just the intercooler core, this results in faster recovery times after wide open throttle and lower intake temperatures. So both upwards and downwards discharge blowers do benefit from the plates. The plates suit LS3, L77, L98 style cylinder heads the style of supercharger will not matter, the plates are 10mm thick and will raise the blower up by 10mm so check to see if you have enough hood clearance before ordering, 10mm isn’t much so they should clear most cars. You may also require a slightly longer drive belt, in most cases your current belt tensioner will have enough room to allow the increased height otherwise a ½ size increase in belts is adequate. When the plates are combined with one of our interchillers the intake temperatures are reduced even further as efficiency is improved even further. The boys at APS SERVICE CENTRE FRANKSTON last week fitted our Thermal Reduction Spacer Plates to a Harrop FDFI 2300 and without any interchiller just the plates only dropped 25c off the intake temp. They were able to make more HP with the new combo. Last edited by GenF-GTS; 20-06-2016 at 12:21 AM. Do you know if this was the older style FDFI charger, or the update with the insulators and revised inter cooler cores? I've got a mate with the early fdfi set up, I'm trying to convince him to look at the work you're doing. It was the new FDFI, works the same on all of them as the are all downwards discharge style blowers and suffer m***ively from engine heat absorbing into the intercooler core. STOP Heat Soak this summer! 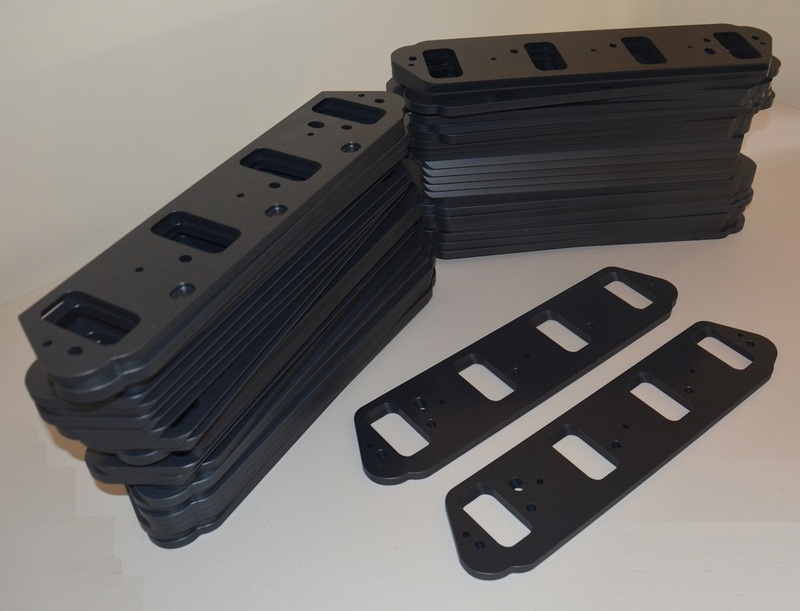 Our last batch of thermal reduction spacer plates sold out really quickly, so we have made up a w**** lot more. Normally $500 per set inc 10.9 grade automotive bolts. For the next 7 days they are only $470 per set inc postage and bolts. Sale on these ends today midnight 25th November!!! We just had this email come through (We've blurred out details for obvious reasons) but I wanted to share it with you guys and explain a few things about it. These downwards discharge style blowers really need blower spacer plates....badly. GM have made their new corvette with an upwards discharge 2650 blower, the downwards discharge style blowers are stuck in the 1990's. Unless this was a hood clearance issue which I highly doubt as Edelbrock have said that the difference in rotor size between the 2300 and 2650 was so small that all they had to do was bore their current blower a touch wider. The smaller 1900 blower is where it is at for drag racing these LS3/LSA engines. This thing badly needs a chiller, reservoir and blower spacer plates. Last edited by GenF-GTS; 03-01-2018 at 01:20 PM. Hi so about to order these with my downward displacement supercharger fitter. Are these a direct bolt on with 5th generation supercharger, or is there more labour hours and bills to me? Thanks for your time and patience! It's cylinder head specific and will suit your heads/blower without issue.